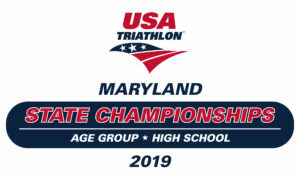 Staged out of St. Mary’s College and Historic St. Mary’s City, the St. Mary’s Triathlon is a spectacular race site nestled between the Chesapeake Bay and the Potomac River, just a few miles from Point Lookout State Park and PAX River Air Station. Situated on a bluff overlooking the St. Mary’s River this race is easy to get to, fun to race and just minutes from great lodging and restaurant options in Lexington Park and Solomon’s Island. You will love the swim course, the buttery smooth pavement and wide shoulders of the bike course and the flat, low traffic run course. This race is a short drive from NOVA! Check out these videos from previous races HERE and register today! Swim: The swim course is a 1.5K meter rectangular course in a sheltered cove on the St. Mary’s River and is staged out of the colleges Sailing Center. The swim start and finish utilizes the St. Mary’s College Waterfront area. So, you’ll be starting off their docks next to their fleet of sunfish and other watercraft. You’ll exit the swim via a beach chute clearly outlined on the beach for swim egress. This is a very healthy portion of the bay with a large oyster population, so we need you to use the dedicated chute to prevent cut feet. The St. Mary’s river is a fairly shallow tributary and warms up quickly, we expect the water temperature to be in the upper 60’s to low 70’s. We will post a preliminary water temperature the Friday evening prior to the event. An official reading will be taken by our USAT officials race morning. There is a 300 meter run from swim finish to the transition area, a pro tip is to leave a set of shoes at swim finish to slip into for the sidewalk run up to transition. Bike: The bike course is fast and mostly flat with the exception of two hills done at the beginning and end of each lap. The course is two loops for the International and one loop for the Sprint. The clockwise course consists of 4 right hand turns per lap with large shoulders on 80% of the course. The scenery is amazing with views of the St. Mary’s River, St. Mary’s College, and the agricultural vistas that make this part of Maryland so beautiful. Run: The Olympic run course is an out and back with a loop at the turn around that is done twice to get the proper distance. The course will have full sun for the first and last mile while the remainder is heavily shaded. There will be an aid station at the start of the run and approximately every mile thereafter. Aid stations for the International will have Gatorade, water and ice. The Sprint run course goes 1.55 miles out, turns around and comes on back. Swim: The swim course is a 750 meter rectangular course in a sheltered cove on the St. Mary’s River and is staged out of the colleges Sailing Center. 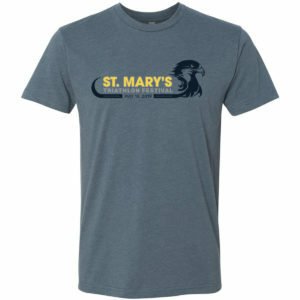 The swim start and finish utilizes the St. Mary’s College Waterfront area. So, you’ll be starting off their docks next to their fleet of sunfish and other watercraft. You’ll exit the swim via a beach chute clearly outlined on the beach for swim egress. This is a very healthy portion of the bay with a large oyster population, so we need you to use the dedicated chute to prevent cut feet. The St. Mary’s river is a fairly shallow tributary and warms up quickly, we expect the water temperature to be in the upper 60’s to low 70’s. We will post a preliminary water temperature the Friday evening prior to the event. An official reading will be taken by our USAT officials race morning. There is a 300 meter run from swim finish to the transition area, a pro tip is to leave a set of shoes at swim finish to slip into for the sidewalk run up to transition. Bike: The bike course is fast and flat with the exception of a small hill done in the first mile going past the swim venue. The course is two loops for the International and one loop for the Sprint. The clockwise course consists of 4 right hand turns per lap with large shoulders on 80% of the course. The scenery is amazing with views of the St. Mary’s River, St. Mary’s College, and the agricultural vistas that make this part of Maryland so beautiful. You’ll love our swag! 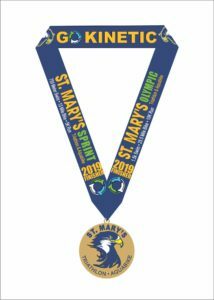 All athletes receive a Tri-Blend Race Shirt, Custom Race Socks and all finishers will get a St. Mary’s themed Finisher’s Medal. Also, don’t forget the DJ, bounce house for the kids and fabulous post race spread. A meal and snacks will be provided to all athletes along with other goodies. Pre-Race Meeting: 7:45 AM at swim start for Olympic, 8:15 AM at swim start for the Sprint. On Site Lodging: How often do you get to stay within a 1/4 mile of the race start and finish area? 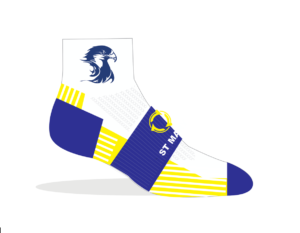 For your convenience St. Mary’s College of Maryland is offering on campus housing in Queen Anne Hall for triathletes and their families. Dorms are three story, fully air conditioned and feature single and double occupancy bedrooms. All rooms are located in a traditional dorm style residence and are furnished with an extra long twin bed, dresser, desk, chair and closet for each occupant. Each floor is equipped with shared a common room and multiple hall baths. Pillows are provided for each bed but linens are not provide. For 2019 Single Occupancy 1 night stay is $30 – 2 nights – $50. Double Occupancy 1 night stay is $55, 2 nights – $100. Learn more and book your room today HERE. Area Lodging: There are dozens of hotels, B&B’s and campgrounds to fit your budget within 20-30 minutes of the race site. Visit the St. Mary’s County, MD website HERE for more information.